The German Bundesliga is one of the four leading divisions within European association football. The Bundesliga attracts the second highest number of stadium attendees worldwide, ranking second only to the American professional football league (NFL). The Bundesliga’s 2016/2017 season has just begun and there seems to be little doubt that this season will see Bayern München top its record four consecutive wins with a further championship title.1 The 54th season of the Bundesliga, however, will also see the entry of a new team. Dubbed “the most ambitious project in European soccer” by the New York Times,2 the creation of RB Leipzig, a synthetic club financed by billionaire owner of the energy-drink producer Red Bull, is bitterly opposed by many fans, for whom tradition is the founding element of their support and interest in the sport. Amid the controversy, skyrocketing transfer deals have also reopened the debate about financial imbalances in association football. These are primarily a result of the new record broadcasting fees introduced by the English Premier League. Public discussions regarding new broadcasting deals in Germany, and in Europe as a whole, are ubiquitous. As of next season (2017/2018), the German Football League (DFL) shall receive approximately €1.2 billion each year for national broadcasting rights. This represents an 80% increase (DFL 2016) on current revenues. Fans’ concerns about the future attractiveness of football have subsequently increased. Many expect that such increases shall be to the detriment of the excitement and suspense of German football – only a few teams will be able to afford to compete for national titles (Bundesliga title or German Cup), or qualify for international cup competitions. In sports economics this issue is described and analysed in terms of competitive balance. In contrast to other markets, demand in the sports market is determined by a limited degree of predictability of matches or championships. Economists refer to this demand as an ‘externality’. If football matches were perfectly predictable there would be no suspense involved in the competition; interest in football and sports in general would diminish in the long-run.3 This precondition is famously characterised by the Louis-Schmeling Paradox (named after two boxers). In order to provide an entertaining fight, Louis needs Schmeling, and vice versa. In public debate and research, salary caps such as those imposed in American sports leagues have thus been proposed as a way of preventing a fall in competitive balance and further increases in the financial resources involved in football. Although there is a significant body of literature which deals with competitiveness in European football leagues, research has as yet been unable to unambiguously prove that competitive balance has decreased.4 Empirical studies dealing with competitive balance have thus far focused on aggregated information available in final league tables. Such studies analyse, for example, the change in the variation of goal margins over time and across leagues. In the theoretical literature, player movement is the most important determinant of sporting success and therefore also the most important determinant of competitive balance. The reliance on aggregate data is therefore surprising; this strategy does enable the direct role of player talent in determining competitive balance to be examined. 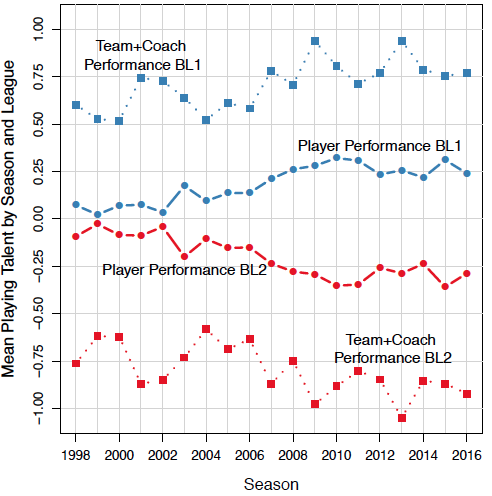 In recent research, we consider the distribution of players to teams in order to clarify whether better players are increasingly playing for better teams (Sittl and Warnke 2016). We observe matches in the 1st Bundesliga, 2nd Bundesliga, and in the German Cup (DFB-Pokal) over a period of almost 20 years. We propose a new method which does not rely on aggregated data such as final league tables, but instead considers the role of individual players and their movements between teams. Our data is based on observations of individual football matches and reflects changes within a given match, such as substitutions or dismissals. Our results show that good clubs are increasingly employing better players (Figure 2). This trend denotes a reduction in competitive balance. In considering the potential causes of this development, we find a correlation with increases in broadcasting revenues (compare Figure 1). Shortly before the insolvency of the Kirch media group at the turn of the millennium, we observe a significant increase in broadcasting revenues. During this period we also observe a corresponding increase in the equalisation of player and club quality. 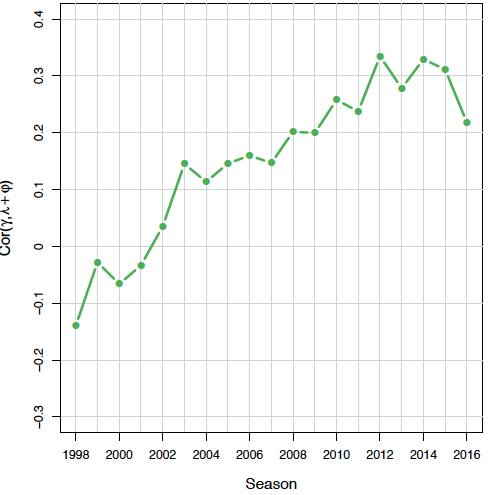 In subsequent years, media revenues remained stable and we see a stagnating trend in the correlation coefficient between player and club quality. However, since 2007 we again observe an increasing concentration of better players at better clubs. This is clearly demonstrated by the fourth consecutive win by Bayern Munich in the German Bundesliga. 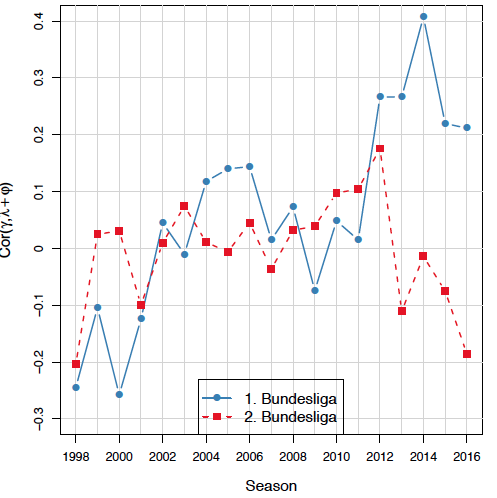 On the other hand, we also see an increasing polarisation within the 1st Bundesliga (Figure 3). Top-ranking teams increasingly outplay the rest of the division. 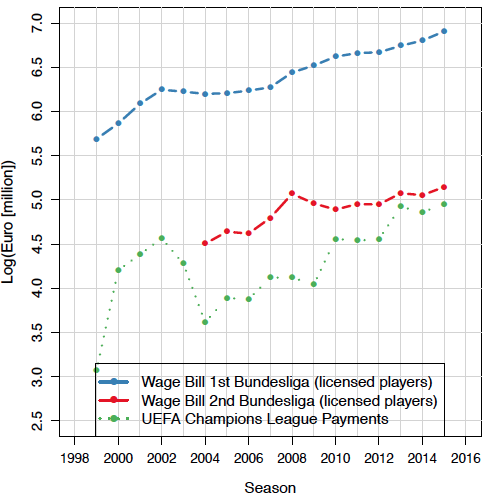 Increasing Champions League payments to participating (top) teams may therefore be one cause for the decreasing competitive balance seen within the 1st Bundesliga in recent years (see Figure 1). In contrast, we observe no similar trends towards concentration of player talent in the second division. Relegation and promotion of clubs seems to play a more significant role in this division. We further demonstrate that player transfers between Bundesliga teams results in assortative matching between players and teams. These domestic transfers do not, however, explain the reduction in competitive balance over time. Reduction in competitive balance is therefore attributed to two other mechanisms. First, the increased availability of up-and-coming young players who might play in the top divisions of the Bundesliga. Young players are now trained in clubs’ own youth academies, which have been mandatory since 2002/03, or are attracted to clubs at a young age. The transfer of players from abroad might also play a significant role here. Second, competitive balance might be reduced by the retention of certain players, such as Bernd Leno, Thomas Müller, or Marco Reus, who could have left the Bundesliga in the mid 2000s when German teams were performing badly in international competitions. Surprisingly, decreasing competitive balance seems to have no influence on fan interest. Stadium attendance has remained at a high level for a number of years and the new broadcasting revenues reflect the huge public interest in German football. Nevertheless, our findings should encourage critical thought about the latest developments in the Bundesliga, as well as in other international competitions. Given the potentially unequal distribution of new, significantly large revenues from broadcasting rights which could reinforce existing trends, critical discussion seems particularly necessary. Research should now place greater focus on the effects of regulations such as salary caps or transfer restrictions on competitive balance in order to provide fans, clubs, and officials with information about the consequences of such institutional regulations. Authors’ note: A shorter version of this article appeared in German at www.oekonomenstimme.org, a partner site of VoxEU.org. We are grateful to Elsbeth Wright for her research assistance. DFL (2016a) “DFL überspringt erstmals Milliarden-Marke bei nationalen Medien-Rechten: Pro Saison durchschnittlich 1,16 Milliarden Euro ab 2017/18”, www.bundesliga.de. DFL (2016b) Bundesliga Report 2016. Frankfurt am Main. Card, D, J Heining and P Kline (2013) “Workplace heterogeneity and the rise of West German wage inequality”, Quarterly Journal of Economics, 128(3): 967-1015. Rottenberg, S (1956) “The baseball players’ labor market”, Journal of Political Economy, 64(3): 242–258. Sittl, R and A J Warnke (2016) “Competitive balance and assortative matching in the German Bundesliga”, ZEW Discussion Paper No 16-058, Mannheim. Smith, R (2016) “We’re Here! RB Leipzig’s Rise to Bundesliga Isn’t Welcomed by All”, New York Times, 26 August. Betting markets currently offer a stake of 1.15 to one euro if Bayern München wins the championship title. According to current betting markets, Borussia Dortmund has the second highest chance of winning the championship. In the case of a win, a bet on Borussia Dortmund would be rewarded with 6 to 7 euros. See, for example, Rottenberg (1956). A discussion of the existing literature is provided in our current study, Sittl and Warnke (2016). The website www.goalimpact.com uses a similar method, although they do not provide any details concerning their specific algorithm. Late substitutions have only a small influence as we weight each player observation according to the minutes spent on the pitch. Players who are often substituted in stopping time are therefore (when no goal for any team is scored) predominantly observed with a goal difference of zero. The respective match has only minimal influence in evaluating a player’s quality. Results are weighted by the fraction of minutes played in a game. Similar methods were, among others, used in the literature dealing with wage inequality or in the literature analysing the effect of ‘good’ teachers on pupils’ learning success, see e.g. Card et al. (2013). Rising inequality between the first two divisions in Germany is also apparent if we look at the betting odds between first and second division teams in the German Cup (DFB-Pokal). The average odds favoring the first division team are continuously decreasing.